Being the experts on all things Tahiti is a commitment we take seriously. 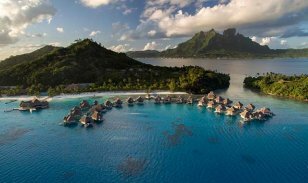 With the recent opening of the Conrad Bora Bora Nui, we’ve been eager to experience Bora Bora’s newest five-star resort. 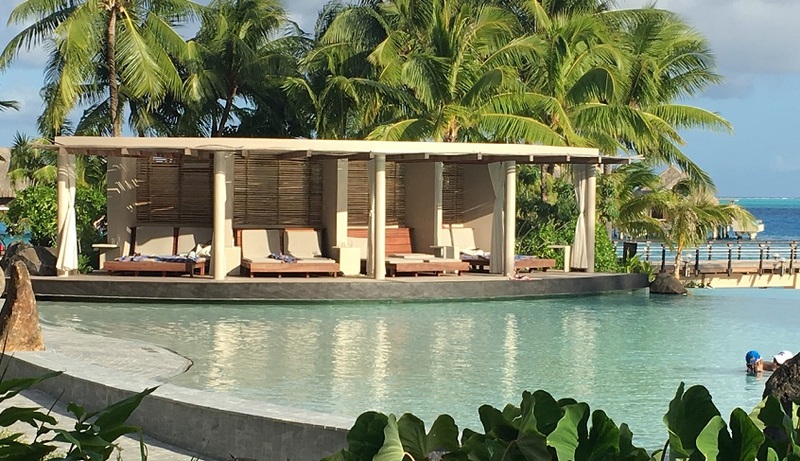 Tahiti Travel Planners team member Jenny Zahradnik had the pleasure of spending two nights at the resort (it’s a tough job, but somebody had to do it). Here’s her take on this new Bora Bora beauty! 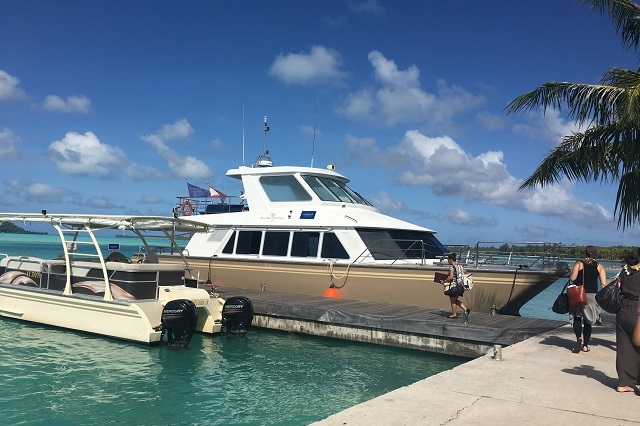 We arrived at the Bora Bora airport and were immediately invited to board the Conrad Bora Bora’s private boat, our mode of transport to the resort’s secluded motu. We stepped outside and there she was, posing grandly above all the others, the beautiful new Conrad yacht. Stepping on to the deck felt like an unexpected first class upgrade. What other delights were in store for us? We, along with five other couples, arrived at the resort after a scenic 20-minute boat-ride. Ushered to a lounge area that sits right on the boat dock, we were welcomed with fresh mango juice and chilled hand towels. As it was mid-morning, our bungalow would not be ready until noon at the earliest. No worries! We changed in to our swimsuits and made a bee-line for the pool—ready to soak up some sun. Lounging in a shaded cabana, we sipped cocktails and enjoyed picture-perfect views of the lagoon. 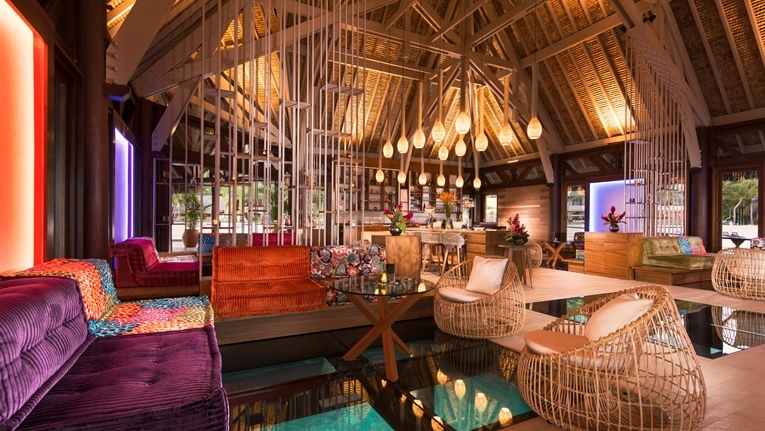 We stayed in an overwater bungalow and upon entering our room we were immediately struck the clean, modern aesthetic of the newly designed interiors. 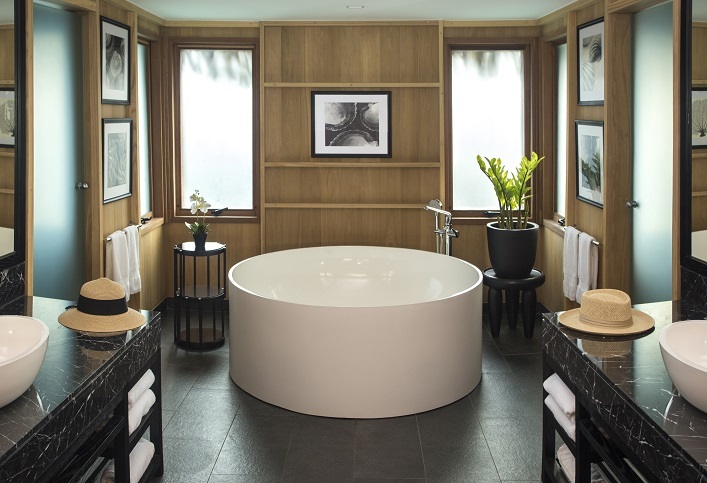 The white linens contrasted with dark woods and natural rattan created a zen-like atmosphere. Our bed faced a large sliding glass door that looked out onto the lagoon; what a beautiful view to wake up to! As you would expect, the bathrooms here are expansive with opposing double sinks, a gigantic soaking tub that easily fits two, and private shower. 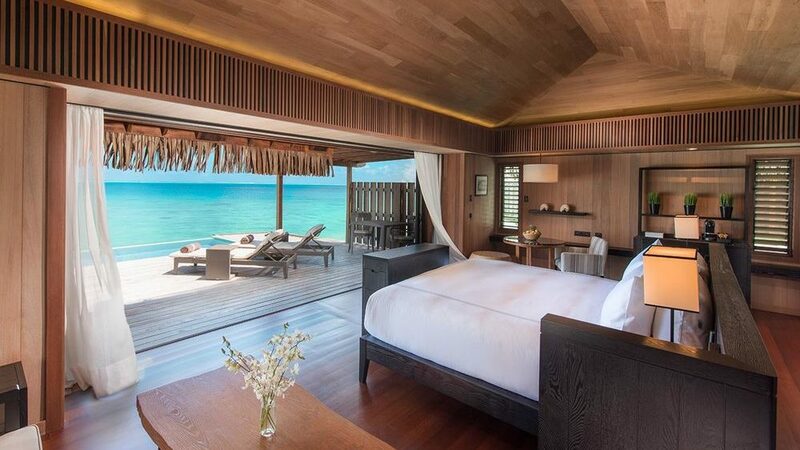 The Conrad Bora Bora Nui will especially appeal to tech-minded guests. Each room is equipped with Bluetooth® speakers allowing you to connect your mobile device and play music in the living area, bathroom, and even on the outdoor deck. The flat screen television is tucked away in a cabinet at the foot of the bed. 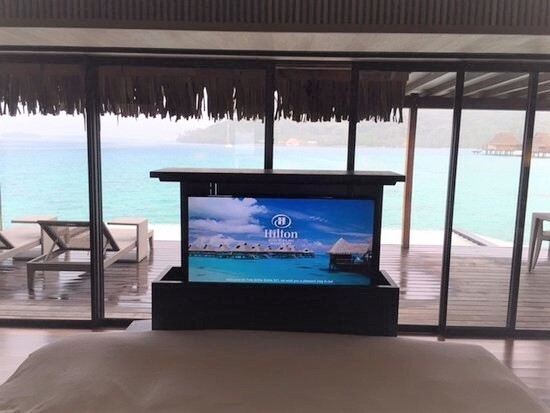 At the touch of a button the screen emerges like a periscope and can rotate a full 180 degrees so you can enjoy from the bed, sitting area, or even the deck. 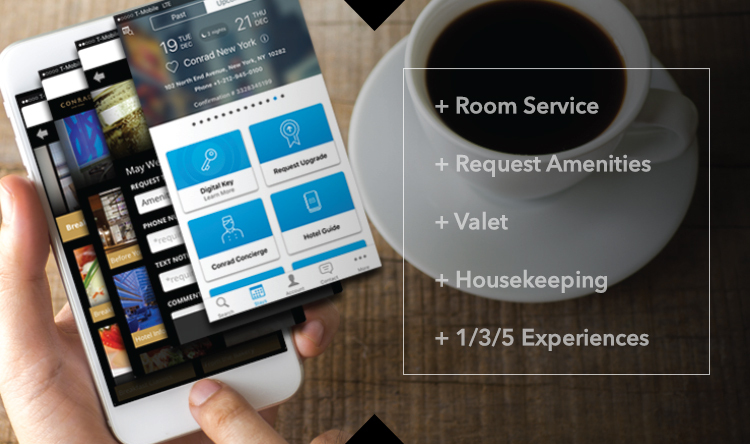 The Conrad Concierge app is a swanky-tech tool that allows you to customize your experience, before or during your stay, through the convenience of your mobile device. Request a special pillow type, ask for more bath towels, even order room service, all with a few swipes from anywhere: your room, the pool, even while you’re on the beach. 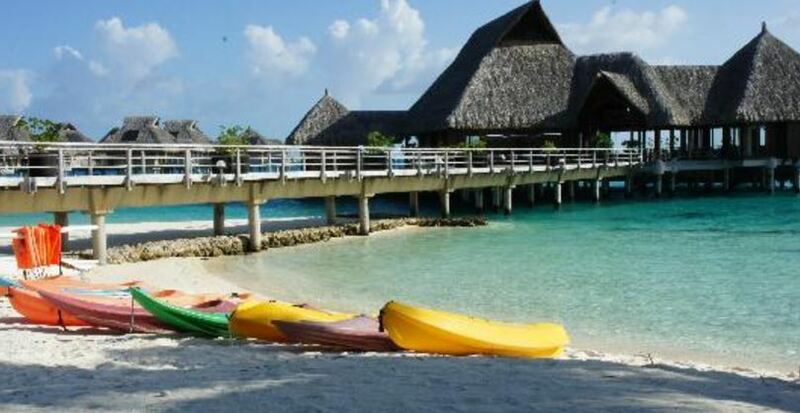 While the Conrad enjoys the largest beach of Bora Bora resorts, there are also plenty of activities to enjoy. 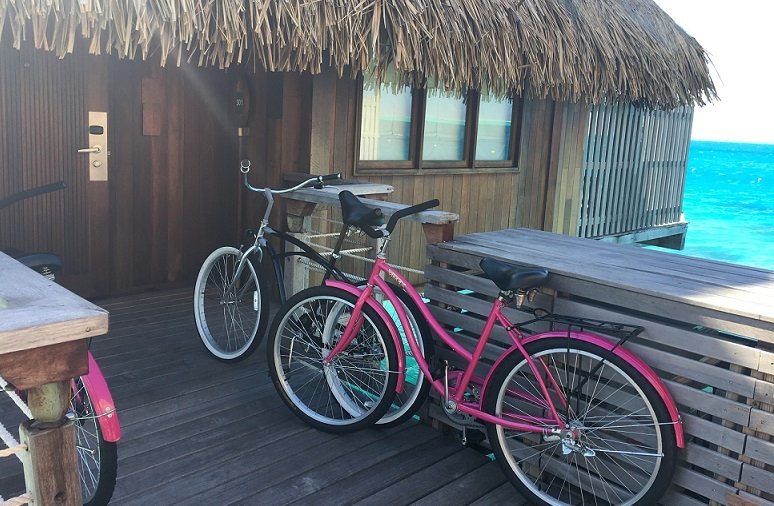 Complimentary kayaks, paddle boards, canoes, snorkeling gear, and bicycles are available and we enjoyed all of them during our stay. There are a variety of food and beverage outlets from casual pool-side fare to exotic Asian fine dining to the lavish Polynesian Buffet and Dance Show (available every Tuesday). The hip Upa Upa Lounge Bar is a delight to experience with its glass floors revealing the water below, whimsical décor, eclectic tapas and cocktail menu, and the best sunset views. Our brief stay at the Conrad Bora Bora Nui was incredible from beginning to end, but there are even more delights in store in the coming months. The resort is committed to elevating the entire guest experience and are working on some additional creative amenities. Think open air movie nights with bean bags on the beach, a traveling ice-cream cart—little touches that bring an element of whimsy and are certain to delight! 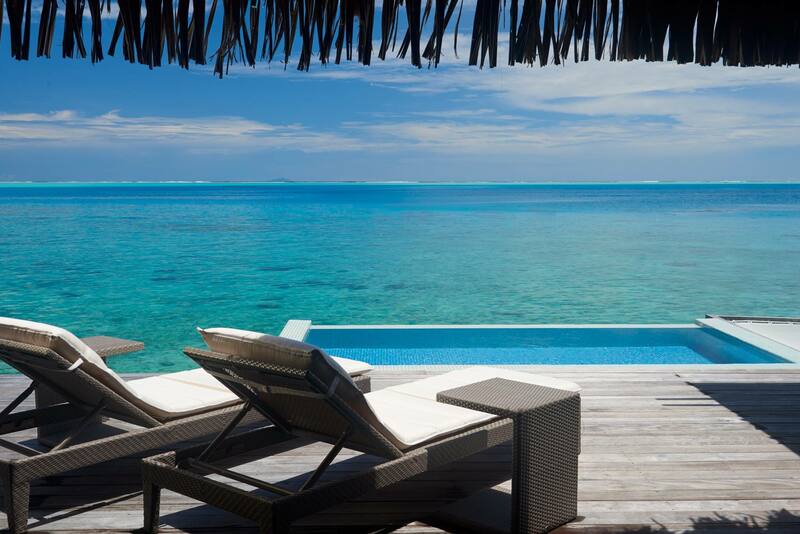 Get in touch with one of our Certified Tahiti Specialists and we’ll tailor a package featuring the Conrad Bora Bora Nui.